The quarantine set up in Dontoria by the Iron Hands to contain the Gellerpox outbreak was not to last. The civilians trapped inside attempted to force their way out, prompting the Space Marines to respond aggressively. Meanwhile, the veil of realspace began to erode, allowing Nurgle Daemons to burst through. Each player must first muster an army from their collection. The Defender commands the Iron Hands quarantine force. The Attacker commands the poxriddled populace, the contingent of Death Guard and the warp-born Daemons of Nurgle. A player can include any models in their army, but if their army is Battleforged they will also be able to use the appropriate Stratagems included with this mission (see below). The Defender creates the battlefield. Each of their deployment zones should be heavily fortified to mark the perimeter of the quarantined zone, whilst the centre is left clear save for a few barricades, obstacles and craters. After terrain has been set up, the Attacker sets up their units wholly within their deployment zone. The Defender then sets up their units wholly within their deployment zones. The Attacker has the first turn. 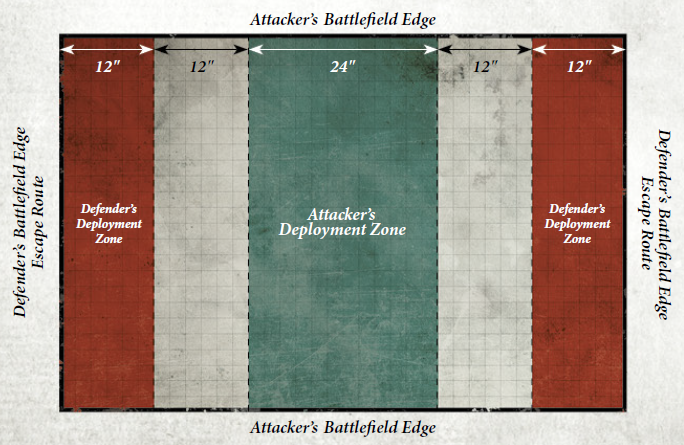 Any unit in the Attacker's army can move off a battlefield edge labelled 'Escape Route' so long as all of the models in that unit are able to make it off the board by that edge in the same phase. Any models that do so are said to have escaped, and are removed from the battlefield and take no further part in the battle. Use the Random Battle Length rules (pg 128) to determine how long the battle lasts. At the end of the battle, add up the Power Ratings of all the Attacker's escaped units (see Escape Route) and compare this to the Power Level of their army (count the entire unit's Power Rating, even if some of its models were destroyed before the unit escaped). If the combined Power Rating of the escaped units is one third or more of the army's Power Level, the Attacker wins a major victory. Any other result is a major victory for the Defender. The veil between realspace and the warp tears wide like agaping wound and out pour the Daemons of Nurgle. Use this Stratagem at the end of your Movement phase. Pick a Nurgle Daemon unit from your army that was destroyed earlier in the battle. Set up this unit anywhere on the battlefield more than 9" from any enemy models. The servants of Nurgle explode with vile fluids that corrode armour and sear the flesh of any caught in the entropic downpour. Use this Stratagem after a unit from your army has been destroyed, before removing the last model from the battlefield. Roll a D6 for each enemy unit within 7" of that model. For each roll of 3+ the unit being rolled for suffers D3 mortal wounds. Once this Stratagem has been resolved remove the last model from the destroyed unit as normal. Driven mad by the foul plague that has infected them, the common people are driven to attack those they once called comrades with unnatural vigour. Use this Stratagem at the start of the Fight phase. Pick a unit of Poxwalkers from your army. Add 1 to the Attacks characteristic of that unit until the end of the phase. With righteous zeal and reckless abandon, these warriors hurl themselves into the enemy lines without thought for their own safety. Use this Stratagem at the start of the Fight phase. Pick a unit from your army. Add 1 to hit rolls and wound rolls for attacks made by that unit until the end of that phase. However, your opponent can add 1 to hit rolls and wounds rolls for attacks that target the unit you picked. Flamer in hand, this Space Marine steps forward to unleash a righteous inferno upon the enemy. A sound of thunder roars from above before the battlefield ignites in a series of devastating detonations. Use this Stratagem in your Shooting phase. Pick up to three enemy units within 12" of each other and roll a D6 for each. Add 1 to the result for every 10 models in the unit being rolled for. On a 5, the unit being rolled for suffers D3 mortal wounds. On a 6+ the unit being rolled for suffers D6 mortal wounds. In this mission, each player can upgrade one of the units in their army to be a mission veteran. If one player takes a mission veteran but the other does not have a suitable model, the player without the mission veteran gains 1 additional Command Point at the start of the battle. Veterans of the Long War, and members of the Seven Pillared warrior lodge, the Putrid Brotherhood were spreading the vile diseases of Grandfather Nurgle for over ten millennia before they set foot on Vigilus. Pick a unit of Plague Marines from your army to be the Putrid Brotherhood. Add 1 to wound rolls for shooting attacks made by this unit that target enemy Vehicles. Under the leadership of Sergeant Idonis, the unflinching aim of Scout Squad Sicaron neutralised half a dozen critical enemy targets without loss of civilian life. Pick a unit of Adeptus Astartes Scouts from your army to be Scout Squad Sicaron. You can re-roll hit rolls for shooting attacks made with sniper rifles by this unit that target enemy Characters.